From the File Menu or the Global Toolbar, select Connect. 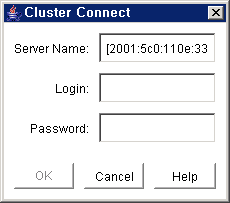 In the Server Name field of the Cluster Connect Dialog, enter the name of a server within the cluster to which you want to connect. Note: If using an IPv6 address, this address will need to be enclosed in brackets [ ]. This will allow a connection to be established through a machine’s IPv6 address. Alternatively, a name can be assigned to the address, and that name can then be used to connect. In the Login and Password fields, enter the login name and password of a user with SIOS Protection Suite authorization on the specified server. If the GUI successfully connects to the specified server, it will continue to connect to (and add to the status display) all known servers in the cluster until no new servers are found. Note: If the initial login name and password fails to authenticate the client on a server in the cluster, the user is prompted to enter another login name and password for that server. If Cancel is selected from the Password Dialog, connection to that server is aborted and the GUI continues connecting to the rest of the cluster.